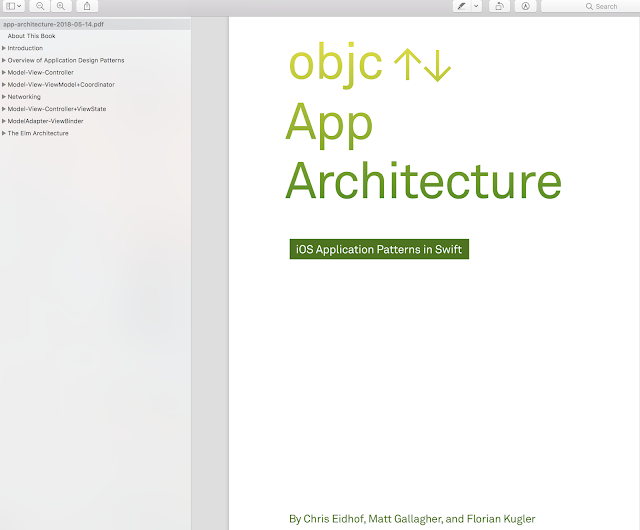 Recently I bought a set of 5 IOS books from Objct.io include App Architecture book And now I want to transfer it to you for $ 30, payment via Paypal. All books are the latest version that supports swift 4 and IOS 11, have PDF, EPUB file and full source code. This book is about application architecture: the structures and tools used to bring smaller components together to form an application. Architecture is an important topic in app development since apps typically integrate a large number of diverse components: user events, network services, file services, audio services, graphics and windowing services, and more. Integrating these components while ensuring state and state changes are reliably and correctly propagated between them requires a strong set of rules about how the components should interoperate. The abstract block diagrams commonly used to describe application design patterns at the highest level do little to describe how these patterns are applied to iOS applications. To see what the patterns are like in practice, we’ll take a detailed look at typical program flows in each of them.